Mies Family Foods has been servicing the Kansas City area since 1968. Ralph Mies started the company selling protein products around town out of the back of his truck. His philosophy of providing superior customer service, quality products, and fair pricing has paid dividends over the years. 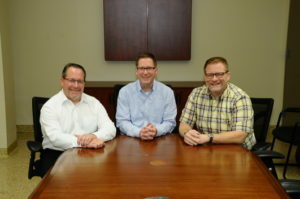 Although the products and size of the business have changed, Ralph’s three sons Mike, Mark and Paul have carried on the same values and traditions that have made Mies Family Foods the company it is today. Today, Mies Family Foods enjoys a state-of-the-art 25,000 square foot facility with the ability to house over 5 million pounds of frozen product and 2 million pounds of fresh product. We now have a fleet of 10 refrigerated trucks servicing the Kansas City, Omaha, and St Louis areas. As an independent distributor with great flexibility and owners who are intimately involved in the daily operations, Mies Family Foods’ operation style simply cannot be matched by our larger competitors. We are proud of our ability to maintain customer loyalty in today’s competitive environment. Mies Family Foods is pleased to provide service to independent restaurants, regional grocery chains, specialty meat shops, further processors, and wholesalers. We listen to our customers and we are totally committed to their total satisfaction in everything we do!